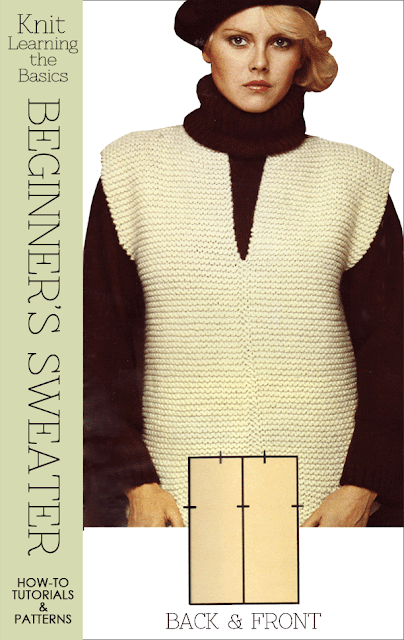 I've always loved this patternbook, which is why it's remained a constant in my knitting library. The simple idea of making garments from squares and rectangles has always fascinated me and was the perfect go-to pattern when teaching someone to knit. Not only does the beginner get to practise their knitting skills with an easy stitch like the garter stitch, but they are quickly knitting up the pieces for their garment. The 4 rectangles that make up this garment also make it easy to design something that is personal and unique. Hopefully you will be inspired as I am and if you are an accomplished knitter maybe you would like a change. Sizing a garment is tricky at best because most of us out there are "Size Queens". What I mean by that is big numbers seem to scare people into thinking that the finished garment will be "way too big". The best way to remedy this dilemma is to find a sweater that you love. 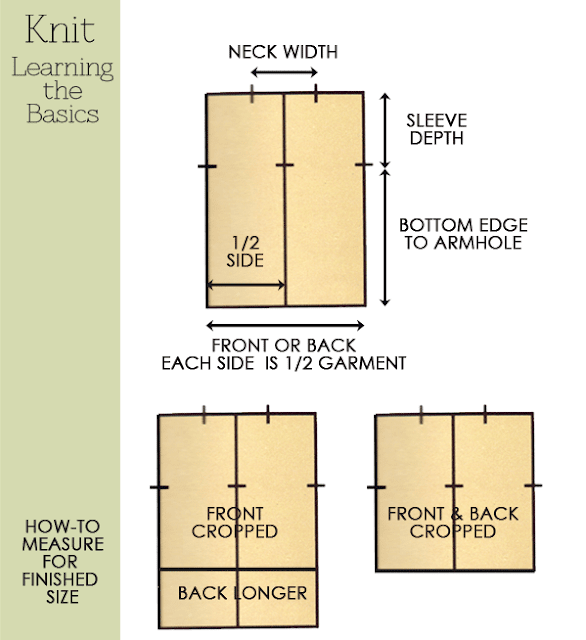 Measure the chest (the widest part of the front), length and sleeve depth as shown on the diagram. Length is truly how you want to wear the garment, cropped with maybe a blouse peeking out from under or tunic length over leggings. Cropped | 22 inches(56cm) - 24 inches(60cm). Tunic | 28 inches(70cm) - 30 inches(75cm). You've watched the video on how to cast on and you've determined how many stitches you should cast on. Away you go, knitting away for about two inches when you start to have a sneaking suspicion that the piece you are knitting is way bigger than the 20 inches you thought you were going to get. Well guess what, you're tension is off. 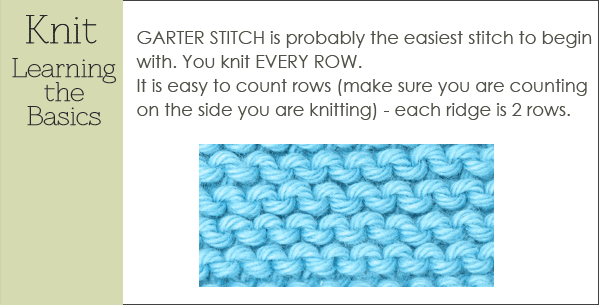 What that means is you may have to use smaller size needles to achieve the correct amount of stitches per inch. My mother had to go down 2 sizes, she was that loose in her knitting. You may also be the opposite where your tension is so tight that it's hard to move the stitches on your needle. A size larger needle may be needed to compensate. By taking the time to make this swatch you know that when you cast on you will get the measurement you want. This pattern, really this design is ideal-it's a blank canvas. As you can see from the illustrations, it's not very difficult to be inspired by garments you see online or in stores to get the imagination rolling. If you come up with some different ideas, please pass them along. I'd be happy to add them to this post. I love this look, vintage yet up to date. Is the first view sewn down the center? I suppose it could be top down, and joined into the round at the underarm. Love it. Sorry I haven't answered sooner but I have been getting the hang of responding to comments. 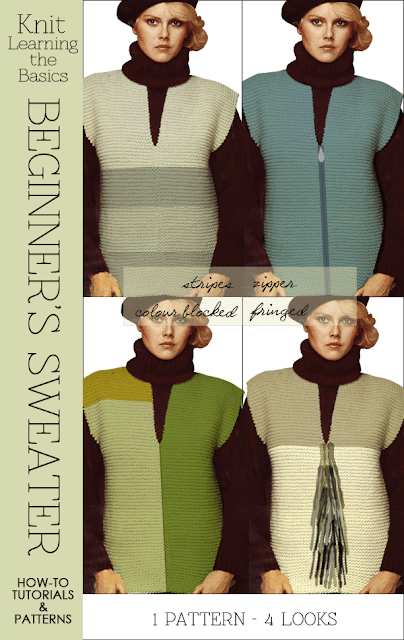 Actually all the views are sewn down the centre.The vest(sweater) is really made up of 4 rectangles. The views really are to inspire people into thinking of ways to customize these rectangles.